Delegates are sometimes seen as an ethereal concept, bodiless and hard to grasp. But they don’t have to be that way. 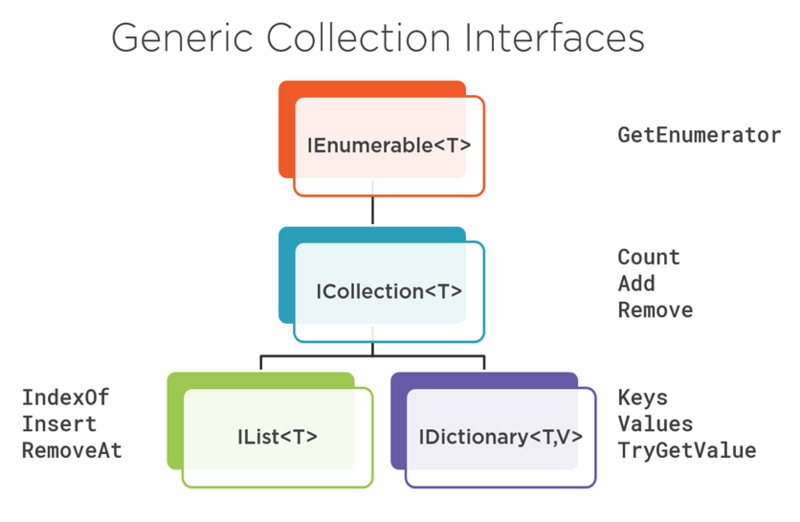 In my latest Pluralsight course: “C# Best Practices: Collections and Generics“, I walk through what a delegate is and how to understand them. A delegate is simply a type that represents a reference to a method with a specific parameter list and return type. The primary purpose of delegates is to pass methods as arguments to other methods. 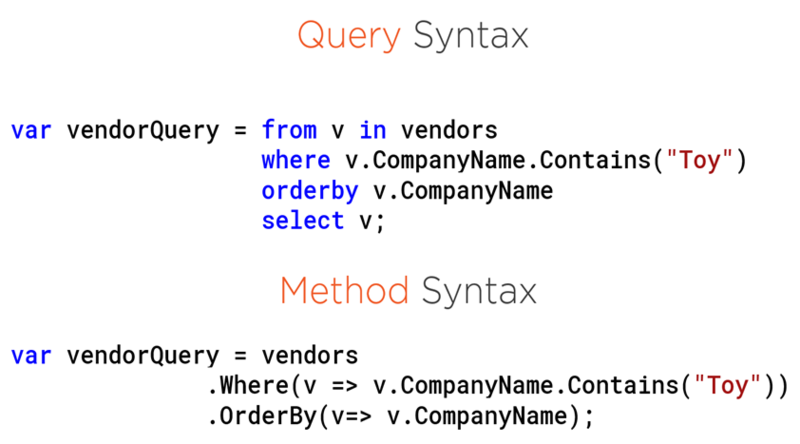 In the above line of code, we use the LINQ Where method to filter a list of vendors. The Where method needs a selector defining the logic to be used for the filtering. Do we want to filter the list of vendors by some keyword in their name? Or by how much they currently owe us? Or by the product types that they sell? Somehow we need to specify this logic. We do that with a method. The “Func” specifies that the method we create has to return a value. If the method does not require a return value, the Intellisense will instead say “Action”. The first generic parameter (Vendor in this example) is the first parameter to the method we create. If there is a return value, the last generic parameter (bool in this example) defines the return value type. So looking at the example, we know we need to create a method with a bool return value that takes one parameter of type Vendor. 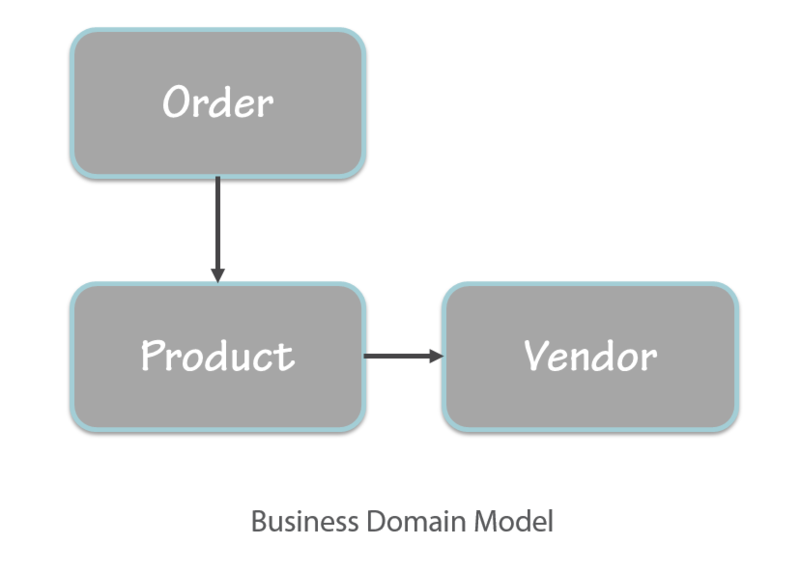 This method takes in a Vendor object and returns a Boolean. 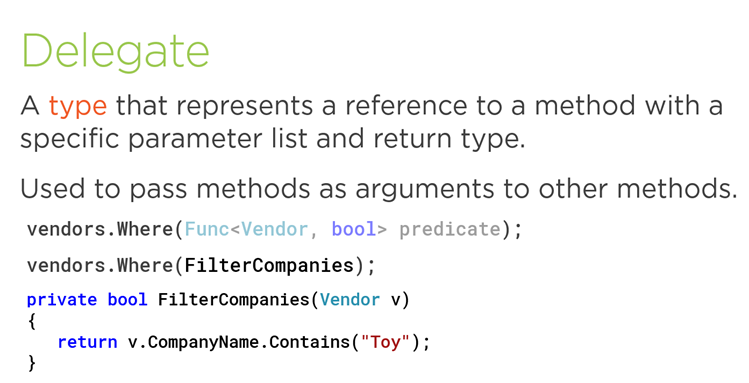 Specifically, it returns true if the vendor’s company name contains “Toy”. Otherwise it returns false, thereby specifying how we want the vendor list filtered. The resulting filteredList contains the list of vendors whose company name contains “Toy”. The problem with this approach is that we end up with little methods all over that simply define these delegates. There is another way. We can use Lambda Expressions. Lambda Expressions are basically a short cut syntax for these little methods. For more information, check out: “C# Best Practices: Collections and Generics” from Pluralsight. 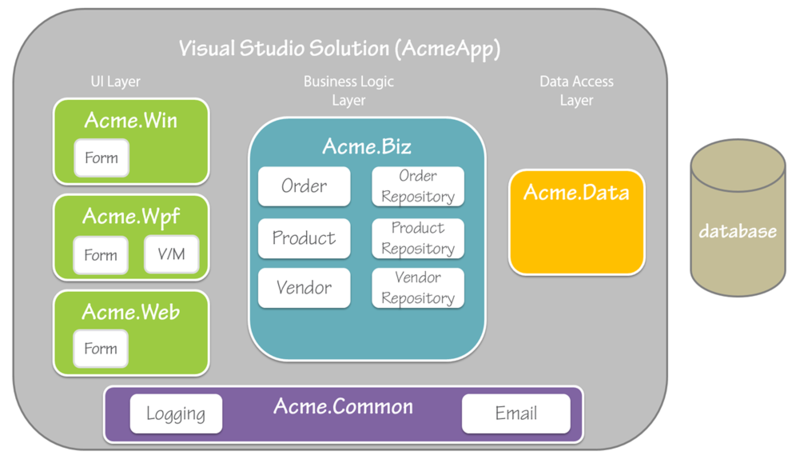 My course on Visual Studio 2015 just went live today on Pluralsight: “Visual Studio 2015: A First Look at the IDE“. 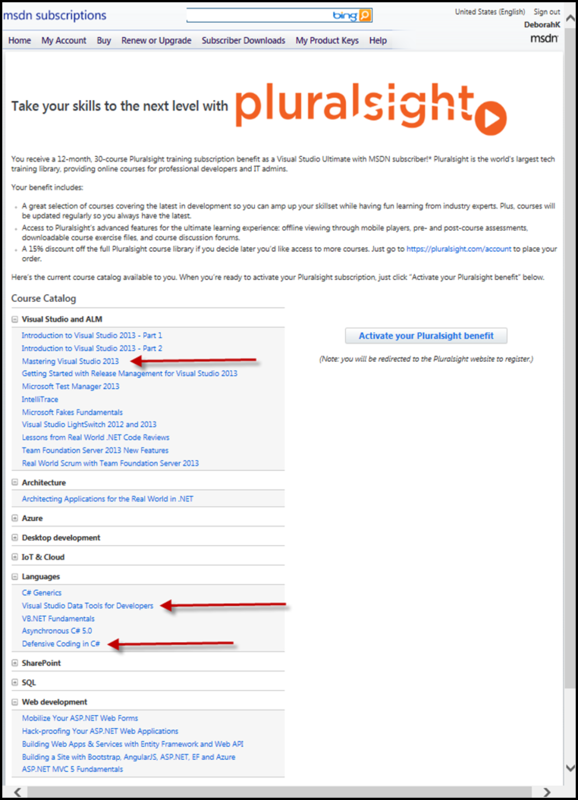 In November of 2014, Microsoft announced that subscribers will receive a 12-month Pluralsight training benefit as part of its MSDN subscription. So if your New Year’s resolution was to update/enhance your development skills, this offer can help. 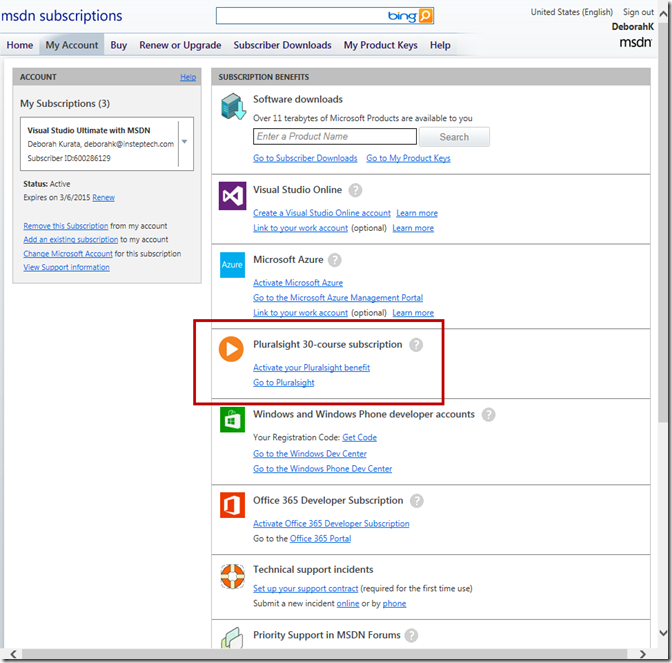 The number of courses included in this benefit depend on the type of MSDN subscription. As an example, my particular subscription includes 30 courses as shown below. This set of course includes three of mine, as indicated above and described below. Mastering Visual Studio 2013 focuses on the new features added to 2013 including Peek Definition, the enhanced scroll bar, Navigate To improvements, XAML editing enhancements, and CodeLen. This course is great if you are already using Visual Studio and want an update on the latest tools and editing features VS 2013 provides. Visual Studio Data Tools for Developers is all about using SQL Server Data Tools (SSDT) in Visual Studio. This course is for you if you use SQL Server and Visual Studio and want to learn how to build database projects, check in database scripts, and easily deploy database changes using SSDT. Defensive Coding in C# is for C# developers that want to write clean, maintainable, and testable code … and keep that code great even in the face of changing requirements, multiple developers, and the passing of time. 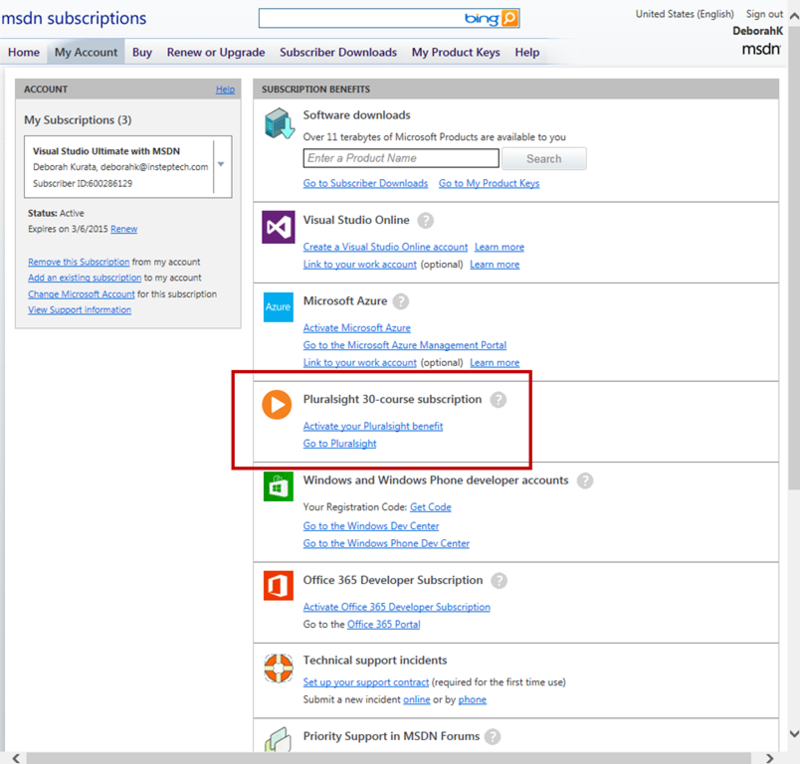 Log into your MSDN account. As developers, we are always looking for ways to hone our skills. If you are a C# developer, there are many paths to take. That is where a learning path can help. A learning path provides a specific set of recommendations for enhancing your C# development skills. The “Getting to Great with C#” learning path shows you how to use the C# language to build well-crafted applications. It focuses less on language features and more on good programming practices and techniques. So if you are already familiar with C# and are looking to elevate your skills, check out this learning path. See this blog post for more information on this learning path. Since publishing my course on Object-Oriented Programming Fundamentals in C# for Pluralsight, I often receive questions from viewers. One of the common questions is on the difference between an Abstract Class and an Interface. It is intended to be used as a base class for other classes that inherit from it. It can provide implementation, meaning that it can contain the code for an operation. The Save method here would contain the code to save a product. You could then create specialized product classes: BookProduct, GroceryProduct, and OfficeProduct. Each of these specialized classes inherit from the ProductBase class. The specialized product classes then don’t need to contain the logic for the save, because it is provided in the base class. Say you then define another abstract class for logging. BookProduct class inherits from ProductBase class which inherits from the Logging class. GroceryProduct class also inherits from ProductBase class which now inherits from the Logging class. So even if the GroceryProduct class does not want or need logging, it still has all of the logging features because Logging is part of its class hierarchy. This can lead to deep inheritance chains that make the code more complex and difficult to maintain/extend. It is intended to be implemented by other classes. Each class that implements the interface promises to provide code for each property and method in the interface. An interface cannot contain any implementation, meaning that it does not contain any code, just declarations. This interface cannot contain any code for the save. So each product class (BookProduct, GroceryProduct, and OfficeProduct) would need to implement this interface and provide its own code for the save feature. Say you then define an interface for logging. Any of the product classes that need logging can implement this interface. You can think of an interface as defining a role that a class can take on. For example, the BookProduct class could take on a logging role, email role, and printing role by implementing a logging interface, email interface, and printing interface. Only the specialized product classes that need logging can implement the ILoggable interface. Each product class that does implement the ILoggable interface needs to provide its own implementation. Other classes (completely unrelated to products) can use the ILoggable interface. The class does not need to be defined within the same hierarchy. You can think of an abstract class as a bucket of functionality shared by all of your relatives. And an interface as a role that anyone in the community can take on. You are building a base class. You don’t need the functionality in the abstract class for any classes other than those within the class hierarchy. You are defining a “role” that a class could take on. You may want to use the interface on unrelated classes. Each class implementing the interface will provide an implementation. Thoughts? Questions? Please use the space below to submit your comments. 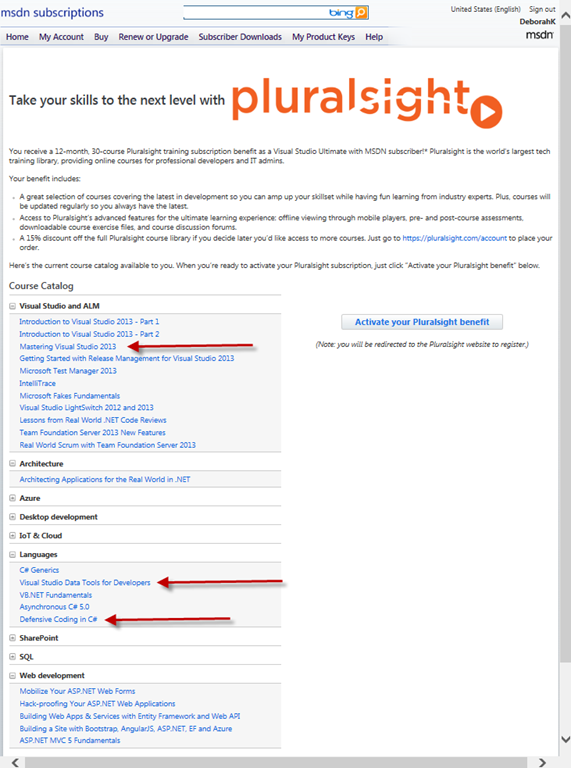 Check out my Pluralsight courses! "I Don’t Have Time for Unit Testing!" So, be honest, when you hear someone talk about unit testing … what is your first thought? Is it: “I just don’t have the time to do unit testing”! Or “Our management will never approve the time for unit testing”? Throughout my career as a software developer, I have seen how much time unit tests can save. Any developer that has written more than a few lines of code knows that it needs to be run to verify that it operates as expected. Right? You need to execute the feature to confirm that it takes appropriate inputs and produces appropriate outputs. You may need to go through this process several times. And as you build more features, it requires more effort to manually test it. For example, say you write a pedometer application that takes in a step count goal and an actual step count and then calculates the percent of goal you have reached. To test the pedometer feature you need to execute the application, navigate to the appropriate feature, enter all of the required data, and then validate the results. And if you find a bug you may have to repeat this process again, and again, and again. For the feature you are working on now, how many times have you run the application to try it out? 10? 20? more? The idea of an automated code test is that you can write code to perform that testing. So if you want to test that the pedometer calculation is correct, you write an automated code test that defines appropriate inputs, calls the function under test, and verifies the results. Then when the users want a change to that code (and you know that they will), you can make the change and just re-run the tests. No need to slog through the UI again for each possible set of inputs. This can save you LOTS of time. You just received a bug report. Something in the code does not work. Instead of trying to reproduce the problem by wading through a bunch of UI, you can instead use your unit tests to quickly reproduce, find, and fix the error. So you are working on some code that is just too painful to deal with. You’d like to apply some refactoring techniques to make the code cleaner and easier to use. With no tests, you are running a risk of introducing bugs if you rework the code. If you have unit tests in place, you can safely perform a refactoring because when you are done with the refactoring, you can rerun the tests to confirm that all is well. You can add new features and rerun all of the existing tests to ensure that the new feature does not adversely impact any existing features. No more worry that adding feature b will adversely affect feature a. So you are in the middle of coding the next feature and you have to drop everything because someone entered something bad somewhere in your application and now it is crashing. Having a good set of unit tests can minimize those annoying interruptions. Don’t you just hate it when the “QA” person emails you to let you know your code doesn’t work? This is especially difficult if that “QA” person if your boss or your client. Having a good set of unit tests can make you look like a coding master! Or what if the person after you changes something and now it looks like your code doesn’t work. Unit tests help the developers that come after you to better understand and modify your code. They can re-run the tests to ensure the code still works after their changes. Having a good set of unit tests verifies that your code works over the lifetime of the application. Writing unit tests isn’t hard or time consuming once you get into the habit. And these benefits look pretty good! For a gentle introduction to automated code testing, see my Pluralsight course: “Defensive Coding in C#”. There is no better defense for the quality of your code than a set of automated code tests. Automated code testing involves exercising code and testing its behavior by writing more code. So you have a set of code that tests your original code. The goal of unit testing is to isolate each unit of code in an application and verify that the unit of code behaves as expected in both valid and invalid conditions. Refactor our code where necessary into individual units (methods) that can be tested. Create a set of tests for each method. Tests that could produce exceptions. Don’t have time to test? See this post! This module is an excellent introduction to unit testing with C#! It takes a viewer on a clear path from zero-knowledge about unit testing to being able to doing useful, real development, unit testing in 45 minutes. It does a very good job of covering both the mechanics and how to make practical use unit testing.